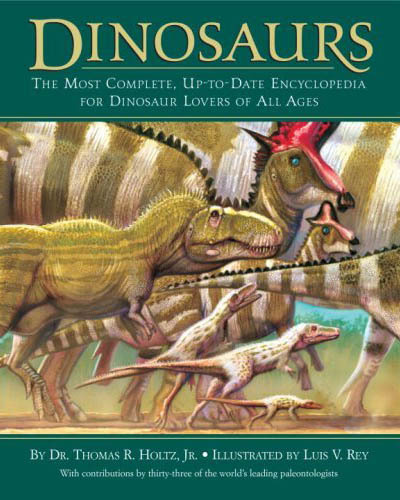 UPDATE FOR 1 January 2015: Apologies to all fans and readers of Dinosaurs: The Most Complete, Up-to-Date Encyclopedia for Dinosaur Lovers of All Ages for the three year delay (YIKES) in updates. I hope the new additions are worth the wait. "I've tried to make this book as up-to-date as I can while I've been writing it. But new dinosaur discoveries are being made all the time. Some of these will just add a species or two to the list of known dinosaurs, but some may be as amazing as finding the first dinosaur fossil with feathers, or the first dinosaur nest, or the first-ever fossilized dinosaur bone!." The purpose of this website is provide you with an update of information on dinosaurs. I'll try to hit the highlights of recent discoveries in the field, chapter by chapter. And I will update these periodically (with dates of new additions listed before the appropriate section). (The initial list of updates date to October 2007, when the book was released). Additionally, I will provide a link at the bottom to an updated version of the Appendix: Dinosaur Genus List, containing newly named dinosaurs and revised classifications. Furthermore, I will provide the complete introduction to that Appendix, explaining what I meant by the various size and weight classes. Also, illustrations by Luis Rey--including several from this book--are featured in the closing credits for the theatrical movie Walking with Dinosaurs 3D (2013). Extraordinarily well preserved "dinosaur mummies" have been in the news. These include "Dakota", an Edmontosaurus (or Anatosaurus), and "Leonardo", a Brachylophosaurus. These two hadrosaurines provide a great amount of information about the "soft tissues" (muscles, skin, etc.) that don't normally preserve. But no, these aren't like Egyptian mummies or the freeze-dried mammoths of the polar regions: the muscles and skin are mineralized, not just dried. NEW December 2010: You know how in the book I write that dinosaur colors do not preserve? Well, color me astonished! It turns out that there are ways that--in rare circumstances--we can figure out some of the colors of dinosaurs. There are many different factors that go into making scales or feathers different colors, one of which are melanosomes: little microscopic structures that hold different color pigments. In turns out that different color melanosomes actually have different sizes and shapes. For example, some are associated with grey or black, others with reddish-brown, and the lack of melanosomes would mean that the feather was white. However, it is important to note a few things. For one, it takes a very special fossil to preserve the melanosome shapes and sizes. Only a few locations with exceptional preservation allow for the survival of the kind of details on the feathers or protofeathers which are visible under a scanning electron microscope. In most dinosaur fossils there simply isn't that kind of microscopic detail present. Also, there is more to color than just melanosomes: they are literally just part of the picture. So these new images of Sinosauropteryx and Anchiornis--amazing as they are--are almost certainly still not 100% correct. NEW January 2015: There is a debate going on in paleontology as to whether the "melanosomes" are really melanosomes (and thus indication of color) or if they are just preserved bacteria. I am not a microbiologist or a histologist, so I am really not qualified to judge the particulars. Additional lines of evidence for dinosaur (and other fossil animal) colors come from preserved trace elements in the body covering, and structural differences in the same that vary the color. NEW January 2008: This doesn't affect the main portion of the book, but the International Commission on Stratigraphy (the organization in charge of the names of geologic time units) has announced that they will be restoring the old "Quaternary Period" (although somewhat longer than the old version: 2.588 million years ago to the present). So the Cenozoic Era will have three periods: Paleogene, Neogene, and Quaternary. NEW December 2011: New geological dating of the various boundaries of the Triassic Period means that the dates in the book are slightly off. The Permian-Triassic boundary is about 252.3 million years ago; the Early Triassic/Middle Triassic boundary is 247.2 million years ago; the Middle Triassic/Late Triassic boundary is 235.0 million years ago; and the Triassic/Jurassic boundary is 201.5 million years ago. Also, refinement of the precise geological ages within some of the better-studied Late Cretaceous geological formations of the North American West has allowed paleontologists to more accurately narrow down the age ranges of many species of dinosaurs from those rock units. I have tried to show those new refined ages in the appendix. These age ranges are MUCH shorter than seen in the earlier versions of the appendix; in fact, in many cases they are just a million year or so. This doesn't mean that these dinosaur genera only lasted for a million years but the ones elsewhere lasted much longer. Instead, it is very likely that most dinosaur genera lasted only a million years or so: the longer age ranges for these other ones are simply an indication that we really haven't narrowed down the times of these rocks as accurately as we have those in the Late Cretaceous of the North American West. A considerable amount of new discoveries have been made concerning the closest relatives of Dinosauria. One of the more primitive relatives of dinosaurs is little Dromomeron from the Late Triassic of New Mexico, close kin to the earlier Lagerpeton of Middle Triassic Argentina. Together these primitive dinosaur relatives form the group Lagerpetonidae. More significantly, though, are several finds related to the reptile Silesaurus shown in Chapter 11. 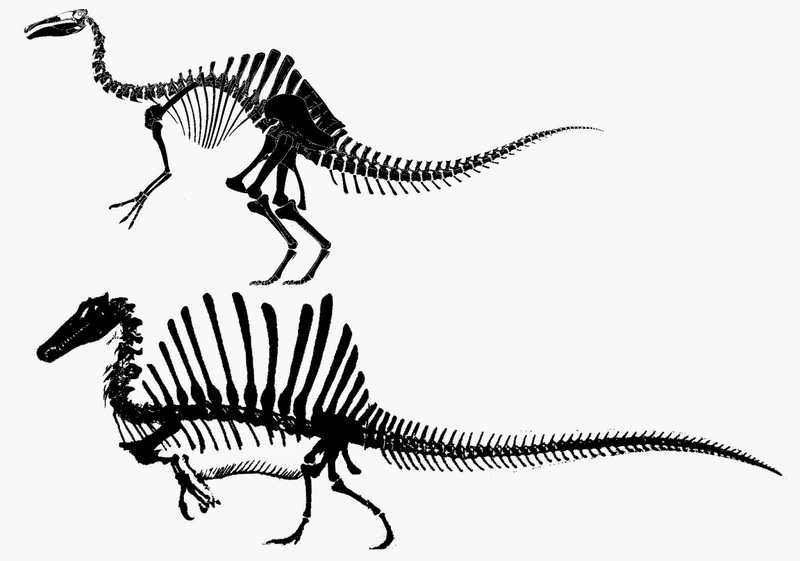 One of these is Sacisaurus of the Late Triassic of Brazil, about 5 feet (1.5 meters) long. The first description of this near-dinosaur was published in October 2006. These two represent a distinct group of herbivores very closely related to the dinosaurs. Like true Dinosauria their pubis and ischium bones are very long; unlike true dinosaurs, their hands do not seem to have been large and grasping, nor do their hips have an open socket. Sacisaurus seems to have a pair of small bones in front of the dentary, similar to the larger single predentary bone of ornithischian dinosaurs. Based on comparisons with the more complete skeletons of Silesaurus and Sacisaurus, it turns out that a number of previously-known creatures from the Triassic belong to this group of "silesaur" near-dinosaurs. These include Lewisuchus and Pseudolagosuchus of the Middle Triassic of Argentina (possibly the same species!) and Technosaurus and Eucoelophysis of the American Southwest. Additionally, some species known only isolated teeth of the Late Triassic Southwest (Crosbysaurus, Galtonia, Krzyzanowskisaurus, Lucianosaurus, Pekinosaurus, and Protecovasaurus) might be from silesaurs, or they might be from a newly-recognized group of herbivorous crocodile relatives the revueltosaurs. In fact, the near-dinosaur silesaurs and the near-crocodilian revueltosaurs represent two of the most important groups of herbivorous reptiles of the Middle and Late Triassic, and they weren't even known five years ago! NEW January 2010: Silesauridae--the group described in the previous two paragraphs--has been formally named. Many analyses now show this group to be the closest known relatives to the first dinosaurs. A sequence of trackway sites in Poland have given us a lot of new information on the rise of dinosaurs and their ancestors. The oldest dinosauromorph tracks are only a few million years after the great Permo-Triassic Extinction, and so it turns out that dinosauromorphs had split from their closest relatives (pterosaurs, and somewhat more distantly the crocodile-line archosaurs) extremely early in the Triassic. Furthermore, there are tracks in the Middle Triassic (older than any dinosaur bone fossil) that are almost certainly from herrerasaur theropods. So it looks like there is strong evidence now for Triassic dinosaurs. NEW December 2013:: Silesaurids continue to show up in rocks around the world from the Middle and Late Triassic. Even closer to dinosaurs, however, is Nyasasaurus, from the same rocks that yielded the fossils of Asilisaurus. Nyasasaurus is known from very few bones, but distinctive features of the upper arm and elsewhere on the body show that it is either the first Middle Triassic dinosaur ever discovered or an animal which was closer to the common ancestor of all dinosaurs than are silesaurids. Let us hope that more specimens of this fascinating little reptile are discovered soon! Debate continues on whether Eoraptor and Herrerasauria are actually theropods or simply primitive saurischians. (Also, note that the new proper term for the larger group containing Herrerasaurus and the other herrerasaurids is "Herrerasauria"). NEW January 2011: Yet more changes! Brand new discoveries from Argentina by Ricardo Martinez of Instituto y Museo de Ciencias Naturales, Universidad Nacional de San Juan and Paul Sereno of the University of Chicago and their teams reveals Eodromaeus, a very primitive theropod, more closely related to Tawa and the neotheropods than are herrerasaurs. However, as part of the study of this dinosaur it was discovered the Eoraptor--long considered either a primitive saurischian or a primitive theropod--is more likely a guaibasaurid sauropodomorph, and thus closer to Diplodocus and Brachiosaurus than to Allosaurus and Velociraptor. Still, Eoraptor and Eodromaeus are still very similar to each other in terms of their anatomy, and they show that the earliest saurischians (and the earliest dinosaurs in general) were all about 1-2 m (3.3-6.6 ft) long, bipedal, with grasping hands and teeth suited equally to plants and meat. In other words, early dinosaurs were sort of "reptilian raccoons". NEW December 2011: Another primitive theropod--closer to neotheropods than are herrerasaurs, but not as close as Tawa is little, buck-toothed Daemonosaurus. Unlike most early theropods, it had a relatively short, blunt snout. NEW December 2013: As additional specimens have been described, the case that Eoraptor is actually a sauropodomorph rather than a theropod continues to improve. On the other hand, whether herrerasaurs are primitive theropods or simply primitive saurischians is still not secure one way or the other. NEW January 2014: Guaibasaurus continues to sometimes fall out as a primitive theropod, and sometimes as a primitive sauropodomorph. Eoraptor, however, does seem to be very securely a primitive sauropodomorph. For now. There is still confusion about the relationships between the primitive theropods. Some studies support the breakdown that I use in the book: the coelophysoids as the first major branch, and a second group of ceratosaurs more closely related to the tetanurines than to the coelophysoids. However, there are some researchers who have evidence that the old 1980s-1990s idea that coelophysoids and ceratosaurs are each other's closest relatives in a a grander Ceratosauria. To make it even more confusing, still other evidence points to a different arrangement. In this third scheme, the slender small coelophysoids such as Coelophysis, Megapnosaurus, Procompsognathus, Segisaurus, and the like represent the first branch separate from group of larger forms. These larger dinosaurs, the Early Jurassic Dilophosauridae, containing newly-discovered Dracovenator of South Africa, Dilophosaurus of western North America, and "Dilophosaurus" sinensis of China. In fact, work first published in September and October 2007 by Nathan Smith (graduate student at the Field Museum of Natural History in Chicago and the University of Chicago) and his colleagues shows that Cryolophosaurus of Early Jurassic of Antarctica is also a member of this group. I think that Smith and his colleagues probably have the closest approximation to the truth so far when it comes to primitive theropods. In this new hypothesis, these 16.5 to 21 foot (5-7 m) long dilophosaurids were more closely related to the ceratosaurs and tetanurines than they were to the "true" coelophysoids. I find this a really interesting idea, and look forward to future research that might resolve this issue. Whether the Late Triassic Zupaysaurus and Gojirasaurus turn out to be early representatives of the dilophosaurids, or big true coelophysoids, or something in between the two remains to be seen. The oldest true ceratosaur in the restricted sense, Berberosaurus of northern Africa, was first described by Ronan Allain (Muséum national d'Histoire Naturelle, Paris) and colleagues in September 2007. This dinosaur shows that true ceratosaurs (that is, the group including Ceratosaurus, Elaphrosaurus, noasaurids, abelisaurids, but not coelophysoids of any sort) were already around by the Middle Jurassic. NEW July 2008: A major restudy of the ceratosaurs has been published by Matt Carrano (Smithsonian Institution) and Scott Sampson (University of Utah). Among other discoveries, they found that Deltadromeus, previously thought to be a giant noasaurid, is more likely a primitive ceratosaur. NEW January 2010: There has been a lot of work on the dinosaurs covered in this chapter. The newly-discovered Tawa of the Late Triassic of New Mexico shows a mixture of primitive theropod and neotheropod features; when it is added into our studies, it shows that even the reduced version of "Coelophysoidea" mentioned in the paragraphs above is not a natural group either. Instead, "coelophysoids" simply represent "the primitive phase of the Neotheropoda." And while Herrerasauria and Eoraptor seem to be more clearly moving INTO Theropoda, Guaibasaurus is moving out: see notes for Chapter 22. Skorpiovenator from the Late Cretaceous of Argentina was first named in 2008, and represents one of the mostly completely known skeletons of an abelisaurid so far discovered. NEW December 2011: Continued work on Late Triassic/Early Jurassic theropods has failed to consistently find a "dilophosaurid" group. It might exist, or some of these dinosaurs (such as Cryolophosaurus) may be closer to averostrans (ceratosaurs plus tetanurines) than to Dilophosaurus. NEW December 2013: Wow, where to begin? Okay: Guaibasaurus may be a primitive theropod, or it may be a primitive sauropodomorph. The "dilophosaurids" have failed to come together as a group. In recent studies (one big one by Matt Carrano, Roger Benson & Scott Sampson, and on-going research by Xing Lida), it was found that Dilophosaurus proper and Zupaysaurus are true coelophysoids, but that Cryolophosaurus and Sinosaurus triassicus (formerly called "Dilophosaurus" sinensis) are primitive tetanurines. NEW January 2015: A new discovery from Venezuela: Tachiraptor from the very beginning of the Jurassic. Although known only from fragmentary material, it seems to be very close to the common ancestor of Ceratosauria and Tetanurae. As mentioned in the comments for Chapter 13, new research shows that the Early Jurassic dinosaurs "Dilophosaurus" sinensis (which will eventually get its own genus name!) and Cryolophosaurus are not primitive tetanurines, but rather part of the Dilophosauridae. On p. 92, the name "Calvadosaurus" is a mistake: the dinosaur in question is properly called Dubreuillosaurus. NEW January 2008: The prosauropod behind Cryolophosaurus on p. 90 now has a name: Glacialsaurus. NEW January 2010: WOW!! There have been some major discoveries and re-analyses within this part of the theropod family tree in the last couple years, many of them due to graduate student Roger Benson of Cambridge University in England. Most of this work was a result of Benson's detailed study of Megalosaurus itself. He and his co-authors have argued that the dinosaurs in this chapter should more accurately be called "Megalosauroidea" rather than "Spinosauroidea", and if I do a new edition of this book I will be using that name. Monolophosaurus, Marshosaurus, and Piatnitzkysaurus (among others) are primitive megalosauroids. Megalosauridae itself contains Torvosaurus, Dubreuillosaurus, Afrovenator, Eustreptospondylus, and some more poorly known forms. NEW December 2011: A new giant spinosaurid, Oxalaia, has been discovered from the mid-Cretaceous of Brazil. 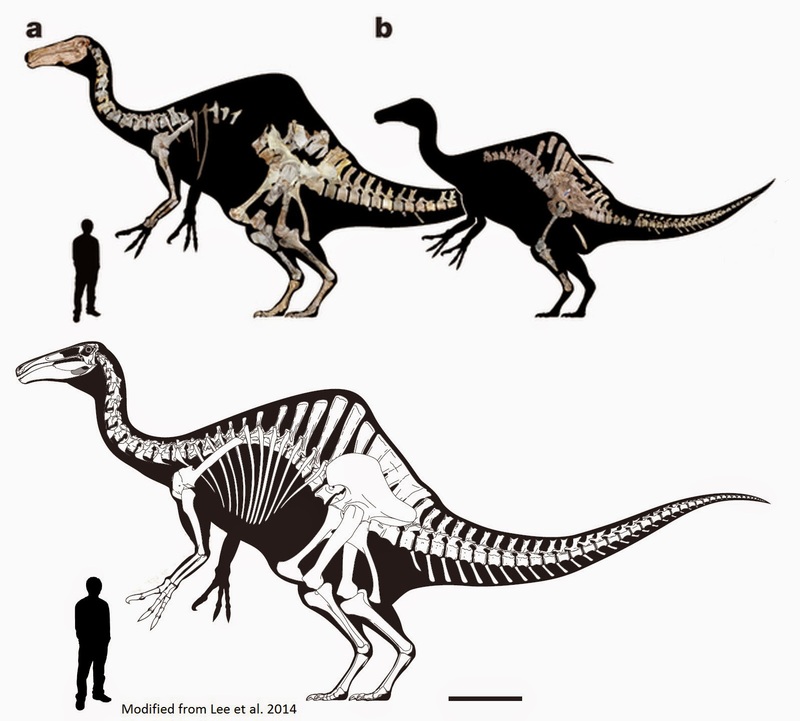 Though known only from incomplete remains, it seems to rival the big African spinosaurids in size. NEW December 2013: REAL big changes here, mostly from the work of Carrano, Benson and Sampson. Their new study forms the major structure of the primitive tetanurine part of the new appendix. As mentioned above, they found that Cryolophosaurus DOES belong in this chapter, as the most primitive-known tetanurine. Sinosaurus (formerly "Dilophosaurus" sinensis), Chuandongcoelurus, and Monolophosaurus are similarly primitive tetnaurines. A careful reader will note that the heads of all of these dinosaurs (where known) have crests: apparently, that was the "in" thing for Early and Middle Jurassic primitive tetanurines. Carrano, Benson, and Sampson gave a name to the group of Megalosauroidea plus Avetheropoda: Orionides, the hunters. Their work found that there was a group of primitive megalosauroids, which they named "Piatnitzkysauridae" (including Marshosaurus and Piatnitzkysaurus) and the more specialized "Megalosauria". The megalosaurians include the lightly built Streptospondylus and Eustreptospondylus, the long-snouted giant Spinosauridae, and the Megalosauridae. Within Megalosauridae they found two groups: the heavily-built Megalosaurinae and the slightly less bulky Afrovenatorinae. In spinosaurid news, at present spinosaurid fossils (sometimes just teeth) have been found in the Early and mid-Cretaceous of South America, Europe, Africa, Asia, and Australia, but still no sign of them in North America. Where are they?!? Chemical study of their teeth shows they they ate more fish than typical theropods in their environment (but that doesn't mean that they actually ate ONLY fish! After all, there are partially-digested bones of a baby Iguanodon in the belly of Baryonyx). NEW January 2014: Whoops! Should have mentioned this in the previous update. The most complete ever megalosauroid skeleton (or at least, probable megalosauroid) was described. There are some unusual aspects to it. For one thing, it is only a baby! For another, it is covered in fuzz!! It was given the name Sciurumimus, "squirrel mimic". But keep in mind this is just a hatchling! We have no idea how big this animal grew! Furthermore, similarities between it and the "compsognathid" Juravenator suggest that the latter may also be a megalosauroid, and not a coelurosaur as previously thought. The fragmentary dinosaurs previously called "Spinosaurus B" and "Sigilmassasaurus" are really just Spinosaurus itself. The hips and legs are rather small for a dinosaur of its size. The limb bones are solid in Spinosaurus, unlike all other theropods except some diving birds. Their ideas have met with some resistance from other paleontologists, it must be added. I am looking forward to the detailed description of the new material, currently being written by the researchers. NEW January 2010: As with the previous chapter, a whole heckuva lot of new discoveries in this part of the dinosaur family tree. In this case one of the main contributors has been Stephen Brusatte (currently a graduate student at Columbia University and the American Museum of Natural History in New York City). As mentioned in the update to Chapter 14, Monolophosaurus has been moved out of Carnosauria into Megalosauroidea. Also, several European dinosaurs that were previously considered megalosaurids or other primitive tetanurines (Poekilopleuron, Lourinhanosaurus, Metriacanthosaurus) are now recognized to be part of Sinraptoridae; because of this, sinraptorids are not strictly Asian dinosaurs anymore. More significantly, however, has been the recognition of a whole new branch of carnosaur: the Neovenatoridae and its subgroup the Megaraptora. Neovenatoridae is a newly-recognized sister group to Carcharodontosauridae (together they form Carcharodontosauria.) Neovenatorids have rather large thumb claws, among other features. Neovenator and gigantic Chilantaisaurus are primitive neovenatorids, while the rest form a group of slender forms called Megaraptora. Megaraptora includes: Fukuiraptor of the Early Cretaceous of Japan; Megaraptor itself (and thus it belongs in Chapter 15, not Chapter 14! ); Aerosteon of the Late Cretaceous of Argentina (this is the "unnamed Argentine carcharodontosaurid" mentioned on p. 104); Australovenator of the Early Cretaceous of Australia; and Orkoraptor of the latest Cretaceous of Argentina. Since Orkoraptor belongs in this group, the carnosaurs actually did make it to the end of the Cretaceous. In other news, new studies show that Shaochilong (previously called "Chilantaisaurus" maortuensis) is a carcharodontosaurid, and thus this group is now known to have lived in Asia. NEW December 2010: A new carnosaur (a primitive carcharodontosaurid) from the Early Cretaceous of Europe has been described: Concavenator. It is known from a nearly complete skeleton with scale impressions. Among the more remarkable things about this dinosaur is a short-but-tall sail right in front of the hips. Possibly more remarkable is some evidence that-- perhaps--it had feathers on its arms! There are a series of knobs along its forearm that are interpreted by its discovered as the connections to large arm quills or feathers (such structures are known on some modern birds and on Velociraptor, for instance). However, an alternative explanation is that these may instead be a line of connection for tissue within the arm muscles. NEW December 2011: The oldest carcharodontosaurid yet described, Veterupristisaurus is known from a few tail vertebrae from the Late Jurassic Tendaguru Formation of Tanzania. NEW December 2013: Continuing Carrano, Benson & Sampson's overhaul of primitive tetanurine relationships, some of the big changes. The lightly-built Lourinhanosaurus of Late Jurassic Portugal remains uncertain where it belongs: they find (like I did, back in 2004) that it is a primitive coelurosaur. Within Carnosauria they find the most primitive branch to be Metriacanthosauridae (what I called "Sinraptoridae" in the book) and the more specialized Allosauria. Within Allosauria are Allosauridae (just Allosaurus and Saurophaganax for now) and Carcharodontosauria. As mentioned above, within the carcharodontosaurs are the gigantic Carcharodontosauridae and the more slender Neovenatoridae, the latter containing some primitive forms and the very slender Megaraptora. 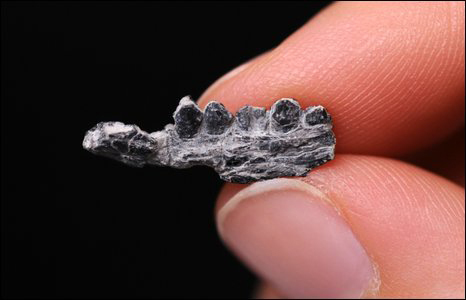 In megaraptoran news, the first megaraptoran from North America--Siats of Utah--has been discovered. Orkoraptor of Argentina has been reedited: I mention above that it lived near the end of the Cretaceous, but redating of the rocks from which its fossils came show that it was from around 90 million years ago. So the book was correct in saying that Carnosauria was gone before the end of the Cretaceous. Are megaraptorans really carnosaurs? In the book I point out that they are hard to place: maybe they are megalosauroids ("spinosauroids" at the time), maybe they are carnosaurs, maybe they are primitive coelurosaurs? A new possibility was suggested by Fernando Novas and his colleagues: that they are actually tyrannosauroids! 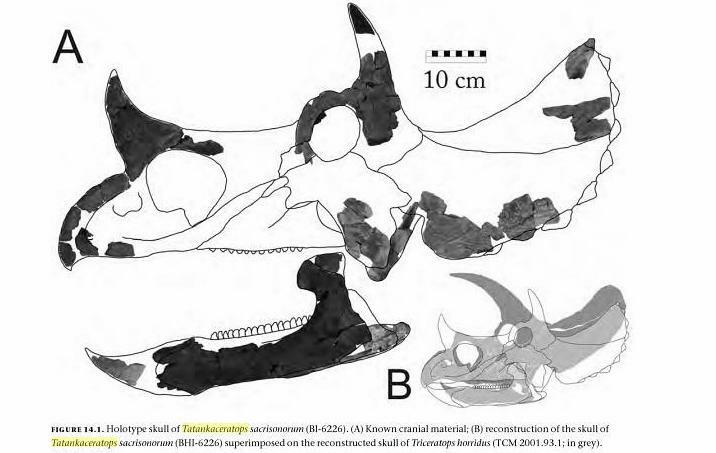 I do see some similarities there, but am not yet convinced that the evidence fits this hypothesis better than the megaraptorans-as-neovenatorid-carcharodontosaurs hypothesis. We'll see what new discoveries are made. NEW January 2015: The discovery of a juvenile Megaraptor specimen does show they had long slender snouts, similar to some primitive tyrannosauroids. NEW January 2008: Last year there were many news reports about the finding that Tyrannosaurus rex "had three fingers". Unfortunately, those reports were not correct. In fact, the real find was a well-preserved third metacarpal (long bone of the palm of the hand) for T. rex: nota surprise as these were already known in other two-fingered tyrannosaurids. In fact, you can see this little bone on the hand skeleton of Tyrannosaurus on the bottom of page 120. NEW January 2010: 2009 was a spectacular year for tyrant dinosaur discoveries. New examination of the skull of Middle Jurassic Proceratosaurus of England shows that it is a very primitive tyrannosauroid, and possibly a close relative of Guanlong. From the later Early Cretaceous of China comes long-snouted Xiongguanlong and tiny Raptorex which help us fill in the spaces of the tyrant family tree. Among other things, Raptorex shows that the dinky arms and pinched foot (arctometatarsus) of Tyrannosauridae evolved in smaller bodied ancestors. NEW December 2010: A new phylogenetic analysis by Stephen Brusatte and Thomas Carr reveals that Proceratosaurus, Guanlong, and a few other newly discovered genera form a clade called "Proceratosauridae", and represent the oldest and most primitive branches of Tyrannosauroidea. NEW December 2011: New tyrannosauroids continue to show up. Among these are Teratophoneus of Utah and Zhuchengtyrannus of China. NEW December 2013: Lots of new tyrannosauroid discoveries. Here are three really important ones: "Raptorrex" is probably not as old as originally thought, and may just be a juvenile of Tarbosaurus; Lythronax the "gore king", the oldest true tyrannosaurid and closer to Tyrannosaurus and Tarbosaurus than to other tyrannosaurids, was named; and most astonishing of all, Yutyrannus of the Early Cretaceous of China was discovered. This is the first giant tyrannosauroid known with fuzz, and it has fuzz all over the body! Previously it was argued that giant theropods may have lost their fuzz, but now we know that even 1.4 ton giants could have it. Oh, and the great old question "which is the biggest theropod? ": dinosaur paleontologist and artist Scott Hartman found that the biggest Tyrannosaurus was BARELY larger than the biggest known carnosaur, but that it is still uncertain if Spinosaurus is more massive then either. NEW January 2015: Among the new tyrannosaur discoveries last year was Qianzhousaurus, nicknamed "Pinnochio rex" because of its long snout. The discoverers consider it to form a group with Alioramus, and they named the group the "Alioramini". I am not altogether convinced that this isn't simply an older individual of Alioramus itself, but if/when new fossils are found, we can sort this out. And if you have an hour to kill, hear about the Life and Times of Tyrannosaurus rex by yours truly. NEW January 2010: New studies by Lindsay Zanno of the Field Museum in Chicago and her colleagues, based on a new species of the therizinosaur Nothronychus, suggest a new relationship among the dinosaurs of this chapter and the next, and a new understanding of their diet and history. In particular, Zanno and colleague's work shows that ornithomimosaurs, therizinosaurs, alvarezsaurs, oviraptorosaurs, deinonychosaurs, and avialians branched off in that order. So if I ever do a new edition of the book, I would probably include therizinosaurs in this chapter (and possibly move alvarezsaurs into the next). NEW December 2010: Jonah Choiniere--then a graduate student at George Washington University in Washington, DC--and colleagues have described one of the most important theropod fossils found in recent years: Haplocheirus. Haplocheirus isn't very big, it isn't very scary, it doesn't have massive teeth or huge crests or anything like that. What makes this dinosaur so important is that it is a very, very primitive alvarezsaur! All the other alvarezsaurs are from the Late Cretaceous, and are very much changed from their ancestral condition, making it hard to clarify their evolutionary relationships. Haplocheirus, however, is from the earliest Late Jurassic (in fact, from the same formation and sites as Guanlong, Limusaurus, and Yinlong) and is not much different from other primitive coelurosaurs. Its hand may not have the giant thumb of later alvarezsaurs, but its thumb is already more powerfully developed than the other fingers. Fossils like these, ones that are near the base of the branch of a particular part of the family tree, are really helpful to paleontologists in figuring out the evolutionary origins and early life styles of different groups. 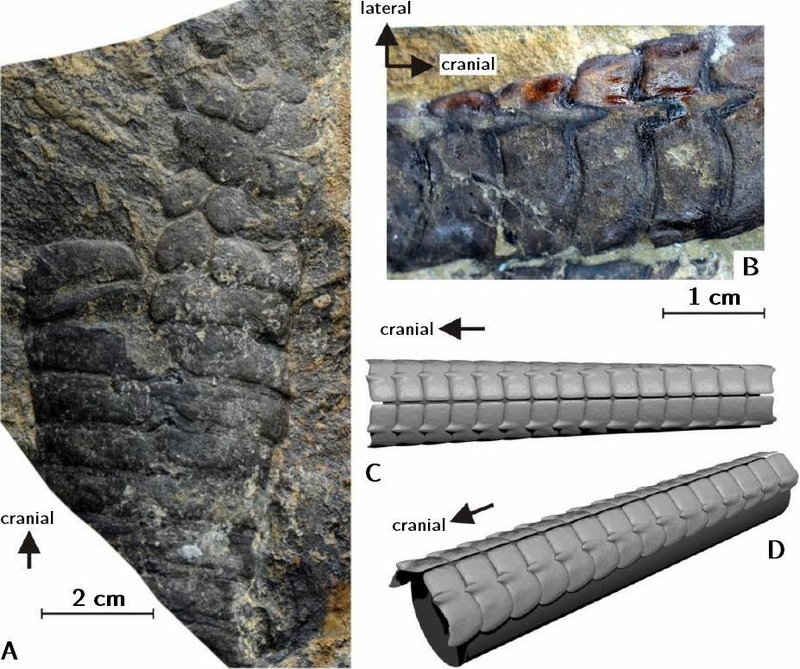 NEW December 2011: It was a good year for alvarezsaurids! Three new genera were named: Albinykus of Mongolia, Linhenykus of China, and Bonapartenykus of Argentina. Also, Bonapartenykus was found with its own eggs, so we finally have definite alvarezsaurid eggs. But keep your eyes peeled: there are big changes ahead for our current understanding of alvarezsaurids (and parvicursorines). NEW December 2013: In a bit of a surprise (because these rocks had not yet preserved feathers or fuzz), fossils from the Late Cretaceous of Canada showed that adult Ornithomimus had broad feathers on their arms, but juveniles were simply fuzzy. And the BIGGEST thing in ornithomimosaur studies: more of the skeleton of Deinocheirus has been discovered! The paper hasn't been published yet, but at the 2013 meeting of the Society of Vertebrate Paleontology the first relatively complete material of the giant ostrich dinosaur was revealed. Unfortunately no skull was presented with this material, but it must be out there! Expect more than arms of Deinocheirus in future versions of the book! NEW January 2015: The BIGGEST news (literally) in ornithomimosaur studies is the description of the new Deinocheirus material. And it is a weird dinosaur! It isn't just a Gallimimus-type dinosaur grown huge, but a weird sort of tiny-brained duckbilled ostrich camel dinosaurs. It has a broad bill like a hadrosaur; a sail on its back, something like Spinosaurus; a forward-tilted pelvis like therizinosaurs; and relatively modestly proportioned legs without an arctometatarsus. The describers consider it, Beishanlong, and Garudimimus to form a group (Deinocheridae) which is the sister taxon to Ornithomimidae. One of the biggest discoveries (literally) among these dinosaurs is the new giant oviraptorosaur Gigantoraptor of the Late Cretaceous of Asia. Xu Xing (Institute of Vertebrate Paleontology and Paleoanthropology, Beijing) and his colleagues first published on this giant in June 2007. As big as tyrannosaurids like Albertosaurus and Gorgosaurus, Gigantoraptor was one of the largest dinosaurs in its environment. And yet it had long slender legs: longer and more slender than those of tyrannosaurids, in fact, so it may have been the swiftest of big dinosaurs. What did Gigantoraptor eat? Well, other oviraptorosaurs seem to have eaten both plants and small animals, and the same may be true of Gigantoraptor. However, to this big theropod, "small animals" may have included sheep-sized ceratopsians and jackal-sized dromaeosaurids! With the discovery of Gigantoraptor, we now recognize that practically all the groups of coelurosaurian theropods produced giants bigger than 1 ton: the tyrannosaurids (of course); Deinocheirus for the ornithomimosaurs; Gigantoraptor for the oviraptorosaurs; and Therizinosaurus for the therizinosaurs. Some taxonomic notes: Following a new scheme, the name "Therizinosauroidea" would be restricted to the more stump-footed sloth dinosaurs, so that the larger category (including slender-footed Falcarius) would be "Therizinosauria". Also, the larger group of Oviraptorosauria plus Therizinosauria (if they do form a group together) would be Oviraptoriformes. NEW January 2010: As I mentioned in the notes to Chapter 18, new studies suggest that Therizinosauria and Oviraptorosauria are not each others closest relatives. Instead, Oviraptorosauria seems to be more closely related to Deinonychosauria and Avialae. NEW December 2011: To add to the discussion of WAIR (wing-assisted incline running), Ken Dial and his students and colleagues have identified another behavior of modern birds that may have been present in broad-feathered dinosaurs: Controlled Flapping Descent (CFD). CFD is a behavior used by young birds, who cannot yet fly, to flap when jumping out of trees to slow and control their landing. It turns out that few birds actually parachute as such; instead, they have an active stroke on the way down. NEW December 2013: The primitive Early Cretaceous theriziosaur Jianchangosaurus shows that it--like ornithopods and ceratopsians--had teeth where the sides rather than the tips came together. Many new oviraptorosaurs have been named. Too darn many, probably! I will not be surprised if many wind up collapsing down into a smaller number of genera, and that what we are calling separate genera are really just males, females, and/or juveniles. NEW January 2015: Important new studies of the function of the claws and beaks of therizinosaurs (both studies led by Stephan Lautenschlager of the University of Bristol) were published. The big latest Cretaceous North American crested oviraptorosaur (the one whose head is the upper left corner picture on p. 144) has been named: Anzu. On a personal note, I am involved with the excavation and description of a specimen of Anzu that has been nicknamed "Pearl". The grouping of Oviraptorsauria plus Dromaeosauridae plus Troodontidae plus Avialae now has a name: Pennaraptora. 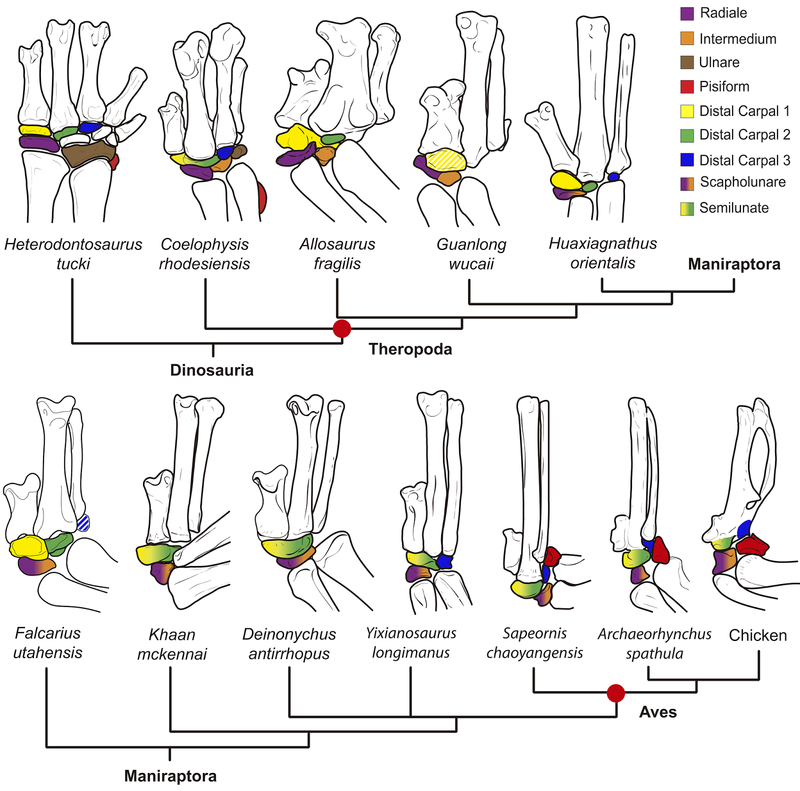 A new detailed analysis of the evolution of the wrists of dinosaurs shows that the origin of the half-moon shaped wrist bone (semilunate carpal) is a pennaraptoran trait. A new big coelurosaurian phylogenetic study by Steve Brusatte (now at the University of Edinburgh) and colleagues found (among other things), that Pedopenna and the Scansoriopterygidae were actually early members of the Oviraptorosauria. If so, this would mean we have Jurassic oviraptorosaurs (predicted by the presence of troodontids and avialians in the Jurassic) and that the oldest oviraptorosaurs were very small tree-dwelling forms (like the oldest troodontids, dromaeosaurids, and avialians). It will be interesting to see if this is confirmed in later studies. 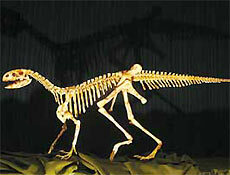 2007 has seen the discovery of several new small Asian dromaeosaurs, including Shanag and Mahakala. The first of these is the oldest known (and first Asian example) of the unenlagiines; the second is a very small primitive dromaeosaurid no bigger than Archaeopteryx. 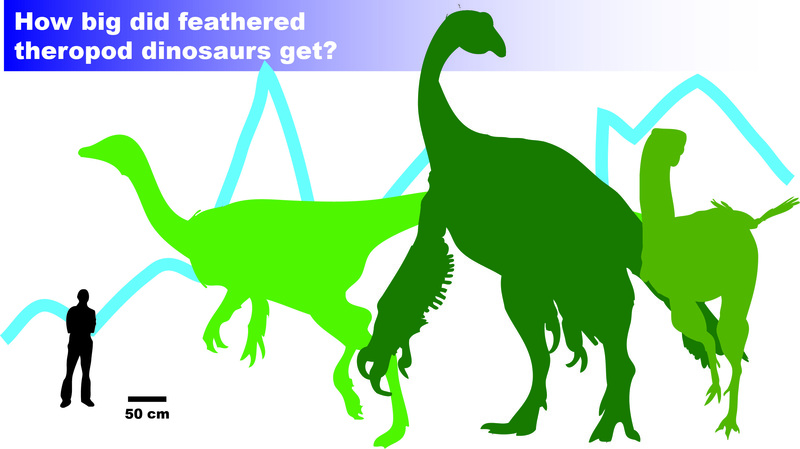 While no one has found the actual feathers of Velociraptor yet (the rocks in which it is found do not preserve feather impressions), a very recent discovery (September 2007) shows that it probably had very big arm feathers. 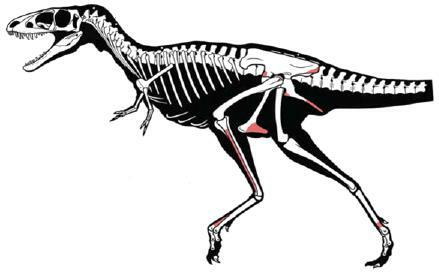 Like little Rahonavis and Microraptor, Velociraptor had "quill nodes": bumps on its ulna (forearm bone) where big feathers attached. While Velociraptor would not be able to fly, it may have used its arm feathers as a help in turning quickly; while brooding its nests; for display; and (while a young one) for Wing-Assisted Incline Running. NEW January 2010: Despite what I said on p. 154, it now appears that Pedopenna and Epidendrosaurus (and newly discovered Epidexipteryx) are indeed very primitive avialians. But, to be fair, they are very close to the common ancestry of avialians and deinonychosaurs. The "giant unenlagiine" discovered by Fernando Novas mentioned on pp. 155-156 has been named: it is Austroraptor (seen in the linked image with Novas himself!) At the other size extreme, little Hesperonychus of the Late Cretaceous of Canada is the smallest known theropod (other than birds) from North America, and the first North American microraptorine. Studies included these new dromaeosaurid have caused some shifting among the various subgroups of dromaeosaurids, which will be included in the 2010 genus list update. On the troodontid side of things, little Anchiornis shows that troodontids a) were present in the Middle Jurassic; b) had long leg feathers like primitive dromaeosaurids and primitive avialians; and c) were cute. Also, with regards to the discussion of brains on p. 161: new studies show that Troodon's brain was exceptionally big even for a troodontid, so it (rather than Troodontidae as group) may indeed have been the brainiest Mesozoic dinosaur. NEW December 2011: A big year for deinonychosaur studies! In terms of behavior, Denver Fowler (of Montana State University's Museum of the Rockies) and colleagues [including a former student of mine, Robert Kambic!] have presented a study which suggests that larger dromaeosaurids like Deinonychus and Velociraptor may have used their sickle claws more to pin prey down while their claws and jaws did the "dirty work", rather than as a "belly-ripper" itself. In terms of classification, big news (and big disagreements!). On the one hand, the discovery of a new little theropod from the early Late Jurassic of China named Xiaotingia shows features of its anatomy that unite it, Anchiornis, and (most important of all) Archaeopteryx into a single group: Archaeopterygidae. What is more, the archaeopterygids were found to be primitive deinonychosaurs, and NOT avialians at all! If this is true, it explains why the pointy faces of archaeopterygids are similar to those of troodontids and dromaeosaurids, but different from the more blunt faces of primitive avialians, oviraptorosaurs, and the like: perhaps the pointy-face condition evolved just once, in the ancestors of all deinonychosaurs. If archaeopterygids are primitive deinonychosaurs, it is quite likely that all eumaniraptorans (deinonychosaurs plus avialians) could fly at first, and that non-flying deinonychosaurs like Troodon, Deinonychus, and Velociraptor all had flying ancestors. However, other analyses find a very different set of relationships. In these, microraptorines and unenlagiines (or rather Microraptoria and Unenlagiidae, using the terminology of these studies), as well as Anchiornis, Archaeopteryx, and Rahonavis, are all primitive members of Avialae and not deinonychosaurs. Unfortunately these studies don't include the information from Xiaotingia, and the "archaeopterygids are primitive deinonychosaurs" study does not include the new unlagiine information. Hopefully a future study will include all this data. The main point of all this isn't that dinosaur paleontologists don't know what they are doing! Instead, the important conclusion is that we now have many species which are pretty close in form to the divergence between deinonychosaurs and avialians; so many that it is difficult to sort out exactly what features go on which side. But since all these animals (Archaeopteryx, Xiaotingia, Anchiornis, Rahonavis, Microraptor, etc.) are all anatomically very similar, we have a pretty good idea of the general appearance of the common ancestor of both groups. NEW December 2013: New Archaeopteryx-like dinosaurs from the late Middle/early Late Jurassic of China have been discovered: Aurornis and Eosinopteryx. These are known from good skeletons. However, the new information doesn't actually solve the problem of where they fit! It is still uncertain if these form their own clade Archaeopterygidae or not, and if so if archaeopterygids (or the individual genera) are primitive deinonychosaurs or primitive avialians (or both!). Similarly, the scansoriopterygids continue to fail to stay in any particular place on the family tree for very long! Work continues on whether, and how well, the primitive deinonychosaurs and primitive avialians could fly. It was suggested by Michael Habib and Justin Hall that the long leg feathers of Microraptor were useful in steering and controlling the direction of flight rather than as wings as such. If so, this suggests that MANY of the early deinonychosaurs and avialians may have used them in a similar fashion, as long leg feathers were really quite common. It is not certain if troodontids and dromaeosaurids form their own clade, or if troodontids are closer to avialians, or if dromaeosaurids are closer to avialians. A three-way split seems the safest bet for the moment. In this newest go-round, Archaeopteryx does fall out as the oldest and most primitive avialian, and Anchiornis, Xiaotingia, Eosinopteryx, Aurornis, and the like are a group of primitive troodontids. On the other hand, Balaur is coming out as a primitive avialian in more and more analyses. New Mesozoic birds continue to be found and described. I have included a more up-to-date classification of early bird groupings in the revised version of the genus list. One aspect of the new discovery of early birds, and of bird-like primitive deinonychosaurs, is that it is getting less and less certain that Archaeopteryx really WAS a bird: that is, that it was more closely related to today's birds than were deinonychosaurs. Work by American paleontologist Julia Clarke and her Chinese colleagues Zonghe Zhou and Fucheng Zhang in 2006 has shown that the typical modern bird tail (with a fan of feathers coming off of a pygostyle) actually shows up later in bird evolution than we used to think. Confuciusornis and the enantiornithines seem to lack this adaptation, which modern birds use to help them steer in flight and in landing. NEW January 2008: The flying ability of early avialians (like Confuciusornis) and possible avialians (like Archaeopteryx) may not have been very good at all. A recent study by Phil Senter (Fayetteville State University) shows that these early feathered dinosaurs could not effectively flap their arms in the right way to generate lift, so that they couldn't have had any sort of sustained powered flight. True powered flight would have shown up later, among the common ancestors of enatiornithines and more specialized birds. NEW December 2011: As discussed for Chapt. 20, there is now stronger evidence that Archaeopteryx is not an avialian at all, but is instead a primitive deinonychosaur. If the archaeopterygids are removed from Avialae, than most of the primitive members of this group would seem to be omnivores at most, and more often strict herbivores (like oviraptorosaurs, therizinosaurs, and other non-deinonychosaur maniraptorans, in fact). At present it cannot be established which are more closely related to advanced birds: the omnivoropterygiforms (Sapeornis and Didactylornis) or the confuciusornithids. The hesperornithiforms are more closely related to living birds than is Ichthyornis: the reverse of most recent studies over the last couple of decades. Then there was the bird that (probably) wasn't. In the middle of the year, a new genus of giant Mesozoic bird (known only from its jaw) was described: Samrukia of the Late Cretaceous of Kazakhstan. However, later the same year French paleontologist Eric Buffetaut challenged the idea that this is a bird, and instead proposed it to be a pterosaur jaw. Curiously, neither paper has actually been printed on paper yet: both represent online "early" versions of papers later to be printed in physical, hardcopy journals. Because of the analysis of Buffetaut, I am leaving Samrukia out of my appendix list until new data shows it is indeed a bird (or other dinosaur). NEW January 2015: Yes, Samrukia does seem to be a pterosaur. On the other hand, Archaeopteryx does indeed seem to be a primitive bird (and a new specimen was unveiled.) As mentioned above, Balaur of the latest Cretaceous of Romania appears to have been a weird large flightless long-tailed bird rather than a weird dromaeosaurid. Most recent phylogenetic analyses agree that there are three basic types of "prosauropod". There are the early small-bodied primitive forms like Saturnalia, Efraasia, Thecodontosaurus, and Pantydraco (the last one was still considered a species of Thecodontosaurus when the book went to the printers!). There are the "core prosauropods": larger dinosaurs including Plateosaurus, Massospondylus, Riojasaurus, Lufengosaurus, Coloradisaurus, and their closest relatives. And there are the "near-sauropods": Yunnanosaurus, Anchisaurus, Melanorosaurus and other dinosaurs more similar to sauropods than to "core prosauropods". The different analyses disagree mainly on whether the core prosauropods from their own group (with all members more closely related to each other than to other types of dinosaurs), or if some are closer to true sauropods and some are more distantly related. Great new skeletons of all three types of prosauropod have been found, and have given us a better view of their anatomy. For example, the primitive sauropodomorphs may have lacked a cheek, but the core prosauropods and the near-sauropods seem to have had a smaller version of the skin or muscular cheek that ornithischians independantly evolved. This would help them keep food in their mouths as they ate. Also, analyses of the forelimbs of these dinosaurs by Matt Bonnan (Western Illinois University), Phil Senter (Fayetteville State University), and Adam Yates (University of Witwatersrand) show that the primitive sauropodomorphs and the classic prosauropods were probably strictly bipedal, and not the "sometimes bipedal, sometimes quadrupedal" dinosaurs that I wrote about and Luis Rey illustrated. On the other hand (so to speak), the near-sauropods seem to have been capable of walking on all fours, and so were more like they were shown in the book. 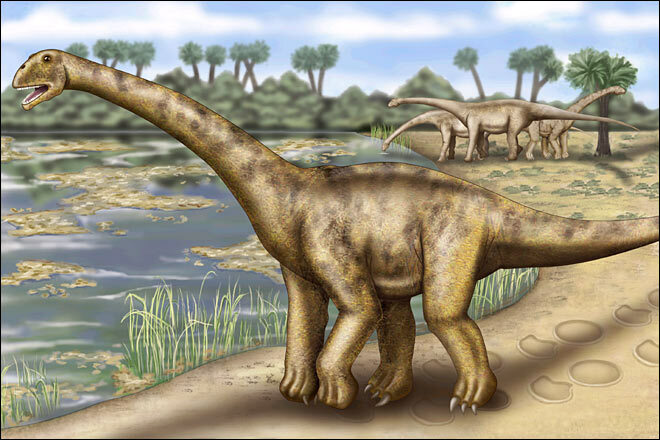 While the vast majority of the prosauropods died out by the end of the Early Jurassic, the first Middle Jurassic prosauropod (a new species of the near-sauropod Yunnanosaurus of China) has been described. NEW January 2008: A newly-discovered core prosauropod or near-sauropod, Lamplughsaura of the Early Jurassic of India, is one of the most completely-known early sauropodomorphs. Study of it will help us understand the evolution of the long-necked plant eaters. NEW January 2010: Yet more discoveries in this part of the tree. Panphagia from the Late Triassic of Argentina (in fact, the same rocks that Eoraptor, Herrerasaurus, and Pisanosaurus come from) is now the most completely known primitive sauropodomorph. Ongoing studies by Martín D. Ezcurra (Museo Argentino de Ciencias Naturales "Bernardino Rivadavia", Buenos Aires, Argentina) and his colleagues suggest that Panphagia forms a group of successful very primitive sauropodomorphs with other genera previously considered theropods (like Guaibasaurus) or sauropodomorphs (like Saturnalia) or even non-dinosaurs (like Agnosphitys). At the other end of the "prosauropod" range is 7 m long Aardonyx of the Early Jurassic of South Africa. This is the most advanced of the bipedal sauropodomorphs: the next branch known were capable of some quadrupedal walking. It had lost the cheeks that seem to have been present on most other primitive sauropodomorphs (including primitive sauropods), and thus could "bulk browse" like more advanced sauropods: that is, open its jaws wide and chomp down on a lot of food quickly. NEW December 2010: The Ezcurra and colleagues analysis mentioned above has now been published, and this group of early sauropodomorphs are now called "Guaibasauridae". NEW December 2011: As noted earlier, at least some studies now place Eoraptor (previously either a primitive theropod or a non-theropod, non-sauropodomorph primitive saurischian) as a guaibasaurid prosauropod. Add to that Pampadromaeus, a primitive prosauropod that looks something like a stretched-out Eoraptor. NEW December 2013: Guaibasauridae, we hardly knew thee… Most recent studies have failed to find a single grouping for "Guaibasauridae", and in fact Guaibasaurus itself may be back to being a primitive theropod! The old "guaibasaurids" turn out to be a series of primitive prosauropod groups, with Eoraptor among them. Depending on how you classify them the "near-sauropods" mentioned in the previous section are considered early sauropods by some paleontologists. 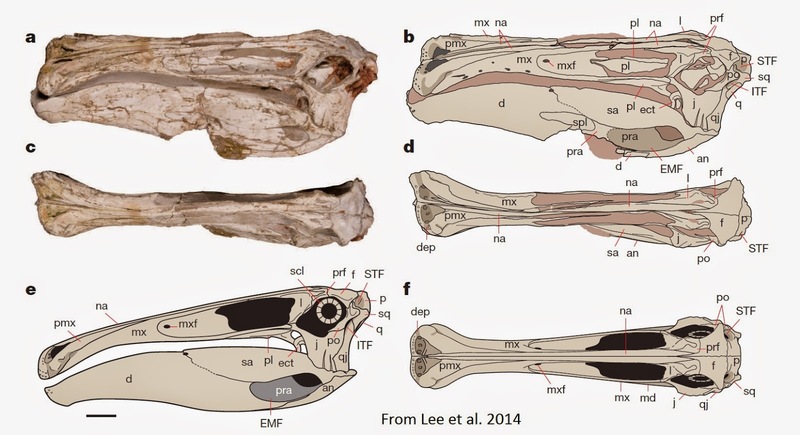 While it is true that most sauropods had the tooth-to-tooth bite I wrote about, newly described jaws from the most primitive sauropods show that they had a bite more similar to prosauropods (with a wraparound overbite and a small cheek). The later sauropods (called the Eusauropoda, or "true sauropods") evolved the tooth-to-tooth contact and lost their cheeks in favor of a jaw that could open much wider. 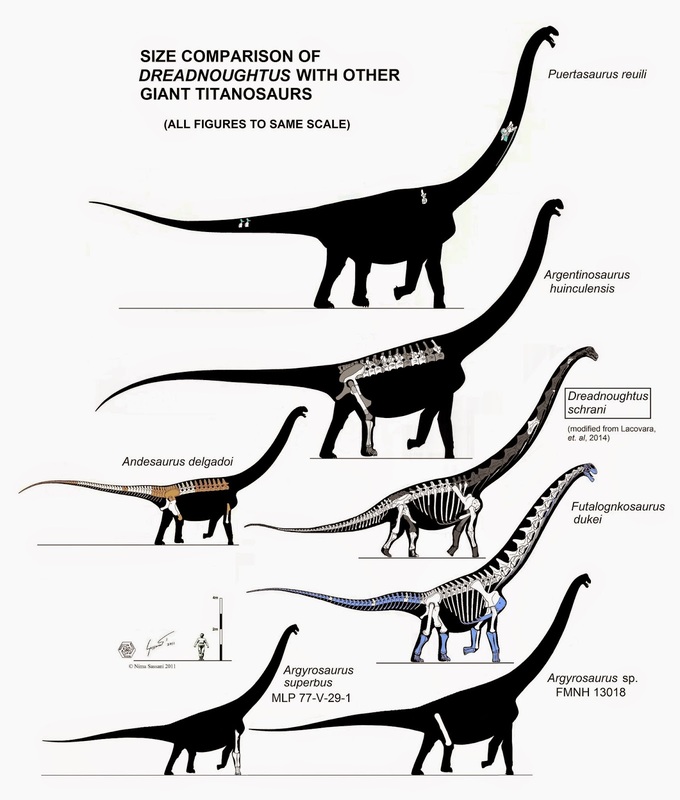 This makes sense when one considers that the heads of eusauropods were about the same size as the heads of the more primitive sauropods and near-sauropods, but the bodies of the eusauropods were MUCH bigger than the other two! They had to chomp and gulp down food as quickly as they could, and not worry about chopping it up in their jaws. A whole new group of primitive sauropod (in fact, of primitive eusauropod) was announced while the book was at the presses! First described in December 2006, this group is the Turiasauria, a Jurassic-to-Early Cretaceous clade of dinosaurs from Europe containing gigantic Turiasaurus (at 48 tons the largest known European dinosaur and one of the largest sauropods) as well as Galveosaurus and Losillasaurus. Also, new phylogenetic analyses suggest that at least some of the Middle-to-Late Jurassic extremely long necked Chinese sauropods that I wrote about (such as Omeisaurus and Mamenchisaurus) belong to a clade that also includes Middle Jurassic English Cetiosaurus, Middle Jurassic Argentine Patagosaurus, and Early Jurassic Indian Barapasaurus. (Long-necked Euhelopus may be related to these, but more analyses still place it as close kin to the titanosaurs within Macronaria). NEW January 2010: One of the newest discoveries among the primitive sauropods is the nearly-complete skeleton of Spinophorosaurus of the Middle Jurassic of Niger. Interestingly, like Shunosaurus, Spinophorosaurus has a spiked club on its tail. On-going work has not resolved yet if Turaiasauria represents a natural group or not. 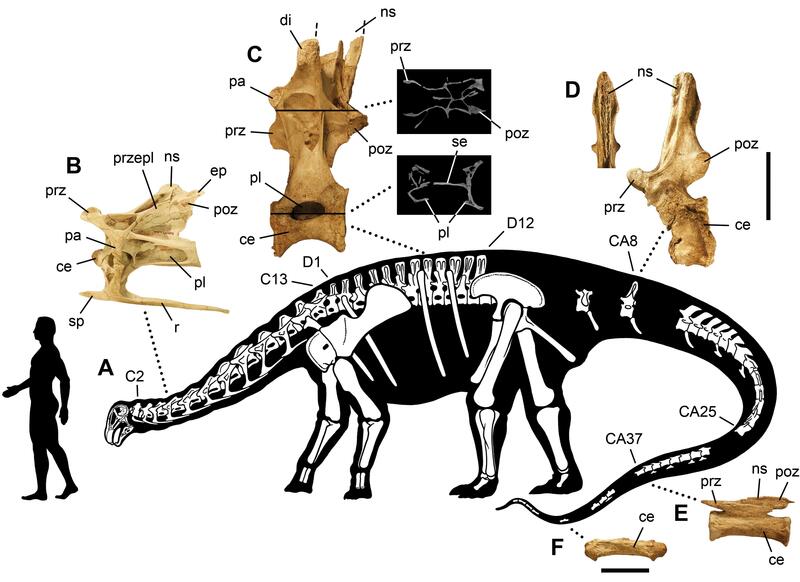 Mamenchisauridae (the group containing Omeisaurus and Mamenchisaurus) does appear to be well-supported, but Euhelopus is not part of it: instead, this other long-necked Chinese form is close to the ancestry of the Titanosauria. NEW January 2008: On p. 199 I wrote "At the time of this writing, no one has put together a complete rebbachisaurid skull or skeleton, so we aren't sure what they looked like." That has changed, thanks to Paul Sereno (University of Chicago), Jeff Wilson (University of Michigan), and their team. They have finally put together the skeleton and utterly-bizarre skull of Nigersaurus. And it is even stranger than Luis drew and I wrote about in our book! Its teeth were apparently replaced at a rate of about once a month: twice as fast as duckbills, which were previously thought to have the fastest rate of tooth replacement in dinosaurs by far. The snout of Nigersaurus was normally head facing straight downwards. It was little (for a sauropod: only the size of an Indian elephant). NEW July 2008: David Lovelace (University of Wyoming), Scott Hartman (Wyoming Dinosaur Center), and William Wahl (Bighorn Basin Foundation) have recently described Jimbo the Supersaurus, a specimen that demonstrates that Supersaurus is its own distinct genus and that was an apatosaurine (that is, it was a diplodocid that was more closely related to Apatosaurus than to Diplodocus). Additionally, their study shows that "Seismosaurus" is not a distinct genus or species, but is just a very very old, very very large individual of Diplodocus longus. NEW January 2015: A newly named diplodocid Leinkupal from the Early Cretaceous of Argentina made the news, but not in a good way. It is the first definite diplodocid from the Early Cretaceous, but this got misreported as being a dinosaur which survived a mass extinction (and some reporters even implied it survived the K/Pg extinction!!). It is a cool discovery, but not THAT incredible! Forgot to mention this last year: Tatouinea, a new rebbachisaurid that shares its name (kind of) with the home world of Luke Skywalker in Star Wars. (Both the dinosaur and the planet are named after the province of Tataouine in Tunisia, which is where the dinosaur was discovered and where the scenes in Star Wars on the planet Tatooine were filmed. A new specimen of Apatosaurus has been found. It is still under study, but based on the length of its femur it is in the same size range as Supersaurus, Alamosaurus, and Argentinosaurus! So yes, the old "Brontosaurus" may regain its claim to fame in the late 19th Century as the "largest known dinosaur"!! The biggest new discovery (September 2007) for this chapter is 106 to 112 feet (32-34 m) and 70 or more ton Futalognkosaurus, a rival with fellow titanosaurs Argentinosaurus and Puertasaurus for the "Largest Dinosaur of Them All" title. Unlike its giant cousins, however, a good percentage of the skeleton is actually known. Its 46 to 50 foot (14-15 m) long neck is the longest of any dinosaur currently known. Many new titanosaurs have been discovered, and the relationships between the various groups is still being worked out. It is likely that the relatively simplistic version I used in the book (with a bunch of primitive titanosaurs and the advanced saltasaurids) will be replaced by a classification with multiple groups of advanced titanosaurs. I have used such a system (based on the phylogenetic analysis of Kristi Curry Rogers (Science Museum of Minnesota) and using names already available from previous classifications) in the revised appendix. In this scheme, Titanosauria includes primitive forms like Phuwiangosaurus, Janenschia, Andesaurus, and the gigantic Argyrosauridae (containing Argyrosaurus and Paralititan); the brachiosaurid-like Antarctosauridae (including Argentinosaurus, Alamosaurus, and Antarctosaurus, as well as some titanosaurs whose names DON'T begin with "A"...); and the Lithostrotia. The latter batch are the forms known to have armored backs (not definitely known in the previously-listed types). Among the lithostrotians are the relatively small Saltasauridae (like Saltasaurus and Neuquensaurus) and the more diverse broad-snouted Nemegtosauridae (including Rapetosaurus, Nemegtosaurus, and spike-backed Augustinia, among many others). However, with all the new titanosaurs showing up around the world, our understanding of the diversity of the titanosaurs is going to change even more! NEW July 2008: Many new titanosaurs have been found in South America. Among them, Futalognkosaurus and Mendozasaurus form a group that has been named the Lognkosauria, or "chief reptiles." NEW January 2010: Jobaria does not seem to be a macronarian, but instead a more primitive form. Also, it and the megalosaurid Afrovenator are NOT from the Early Cretaceous as long thought: instead, the rocks they are found in come have been redated to the Middle Jurassic. Re-examination by Mike Taylor of the true North American Brachiosaurus altithorax and the African species typically called "Brachiosaurus" brancai confirms that the latter is distinct from Brachiosaurus proper, and thus is more properly called Giraffatitan. A comment on p. 205 of the book led to this discussion on the Sauropod Vertebra Picture of the Week blog. NEW December 2010: Nearly all sauropods are known from the limbs and vertebrae, but skulls are rare. An exception is newly discovered Early Cretaceous brachiosaurid Abydosaurus of Utah, for which four extremely good skulls are known. NEW December 2011: One of the most complete-ever titanosaur skulls has been found: that of Tapuiasaurus of Brazil. Also, new specimens of the Late Cretaceous North American titanosaur Alamosaurus show that it is about the same size as the largest known dinosaurs (such as Argentinosaurus, Puertasaurus, Futalognkosaurus, and Ruyangosaurus). This means that Tyrannosaurus (the largest known North American theropod) likely preyed on the largest North American dinosaur, at least on occasion and at least in the southern part of its range (Alamosaurus is not found in the northern states nor in Canada, yet). NEW December 2013: Some major revisions of the macronarians have been published: some by Michael D'Emic, others by Phil Mannion and colleagues. Unfortunately, they don't always agree with each other, so I've sort of picked and chosen from both of them for the organization of the current appendix. Most of the new studies do support a Brachiosauridae group, and several a Euhelopodidae group; I use both of these. Sauroposeidon is consistently closer to titanosaurs than to brachiosaurids. And Titanosauria is now a strictly Cretaceous group. 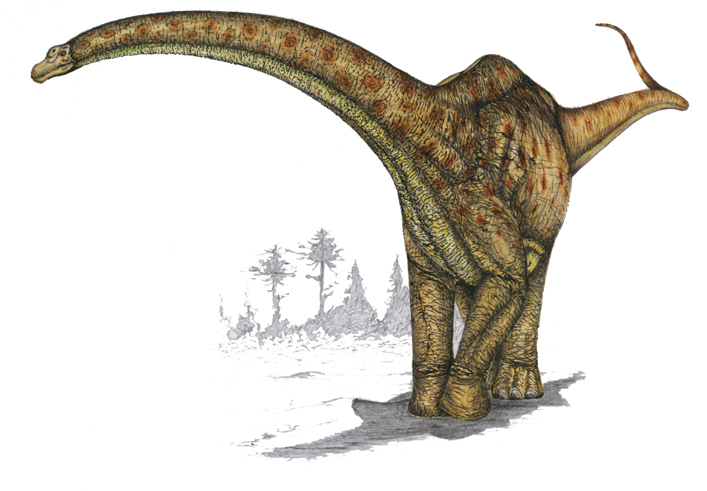 NEW January 2015: The big news in macronarian studies is a new big macronarian: Dreadnoughtus. Despite some news reports it is definitely NOT the largest known dinosaur, but it is the most completely known really large dinosaur. And the specimen was not an adult, so it might have achieved the size of Argentinosaurus, Alamosaurus, and kin. In related news, Futalognkosaurus was probably overestimated in size, and was slightly less heavy than Dreadnoughtus. Everything you know about early ornithischians is wrong! Okay, that's an overstatement... But recent work in 2006 and 2007 by the team of Randall Irmis (University of California, Berkeley), Sterling Nesbitt (American Museum of Natural History), William Parker (Petrified Forest National Park), and various colleagues have revolutionized our identification of Triassic ornithischian dinosaurs. Basically, a re-examination of the evidence shows that most of the previously described Triassic "ornithischians" turn out to be from either the near-crocodilian revueltosaurs or the near-dinosaurian silesaurs, two non-dinosaurian types of herbivorous archosaur they we didn't even know about a few years ago. The only remaining definite Triassic ornithischian is the oldest and most primitive one, Pisanosaurus, and an unnamed Triassic member of the Heterodontosauridae. Oh, wait: turns out another Triassic ornithischian showed up in June 2007! This is Eocursor, a Late Triassic South African ornithischian. Like heterodontosaurids and saurischians, but unlike all the other ornithischians, Eocursor still had the relatively large grasping hand of the earliest dinosaurs. In their initial description of this new dinosaur, Richard Butler (Cambridge University and the Natural History Museum, London), Roger Smith (Iziko South African Museum), and David Norman (Cambridge University) also reanalysed the relationships between various ornithischians, and found that heterodontosaurids are indeed very primitive ornithischians and not ornithopods at all. NEW January 2010: A couple of important new discoveries among the heterodontosaurids. One of these is tiny Fruitadens of the Late Jurassic of western North America. This is one of the smallest ornithischian dinosaurs ever found: only 70 cm (not quite 28 inches) long! More spectacular--or maybe just more surprising--is Tianyulong. It was first thought to come from the Early Cretaceous, but now is known to date to the Middle Jurassic. That's not the surprising thing, though. What is the surprising thing is that it had protofeathers along its back (at least). Now up until this discovery there was no definite evidence of feathers or protofeathers outside of the coelurosaurian theropods. (It is true that Psittacosaurus had its quills, but these were not clearly derived from the same anatomical features as protofeathers.) Now we've got fuzzy ornithischians. This means that the common ancestor of all dinosaurs may have sported some fuzz, and that Luis Rey's fuzzy Leaellynasaura on p. 248 may turn out to be accurate! NEW December 2011: To go along with tiny Fruitadens among the smallest ornithischians, we now have Manidens of the Middle Jurassic of Argentina. NEW January 2015: From the very beginning of the Jurassic of Venezuela comes Laquintasaura, a primitive ornithischian. It was found in a group of individuals, which may suggest that herding went very far back in ornithischian history. NEW January 2010: A bizarre new discovery is Miragaia of the Late Jurassic of Portugal: a stegosaur with a long flexible neck like a sauropod. The first definite Asian members of Nodosauridae have been described: Zhejiangosaurus and Zhongyuansaurus. NEW January 2010: Biomechanical studies led by graduate student Victoria Arbour of the University of Alberta calculated the force that ankylosaurids could generate with their club tails. The short answer: they could indeed break bone, especially the big ones. NEW December 2011: Zhongyuansaurus has subsequently been found out to have been an ankylosaurid, and not a nodosaurid after all. This was part of a massive phylogenetic study of the Ankylosauria by Richard Thompson, Susannah Maidment, and Paul Barrett (all of the Natural History Museum, London) and Jolyon Parish (of the University of Oxford). This study found that basically all ankylosaurs could be divided into Nodosauridae and Ankylosauridae (the old model), and that "polacanthids" do not form their own distinct group. These changes are reflected in the new appendix. Also, one of the weirdest fossils of any dinosaur was named this year: what looks like the impression of a body of a baby nodosaurid from Early Cretaceous rocks pretty close to where I work! This has been given the name Propanoplosaurus. I'm still suspicious if this is really the impression of a dinosaur at all, and not some sort of other object that our minds are tricking us into thinking is a dinosaur. But I don't have any actual data to back up that suspicion, so until someone can demonstrate this is not the fossil of a dinosaur, I'll give it the benefit of the doubt. NEW December 2013: The Ankylosauridae, and in particular the Late Cretaceous North American ankylosaurids, have been re-examined by Victoria Arbour, who has found that we have been "lumping" many different distinct genera into "Euoplocephalus". So old, early 20th Century names like Anoplosaurus, Scolosaurus, and Anodontosaurus are back! A HUGE new study of ankylosaur interrelationships is on its way, but hasn't come out by the time I write this. A few aspects of this (such as the diversity of Struthiosaurinae) are included in this version of the appendix, and when the analysis is out I will revise the entire appendix accordingly. NEW January 2015: Two new ankylosaurids, and two new dinosaurs for "Z" in your "Dinosaurs A-to-Z"-type encyclopediae: Ziapelta of New Mexico and Zaarapelta of Mongolia. 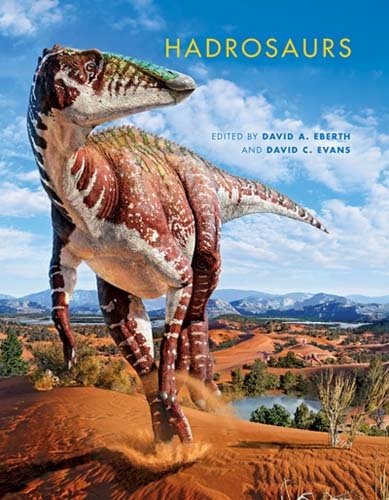 The analysis of ornithischian dinosaurs by Butler, Smith and Norman (see the comments on Chapter 26 above) indicates that "Othnielia" (recently renamed Othnieliosaurus by Peter Galton), Agilisaurus, and Hexinlusaurus are all non-ornithopods, but are simply Jurassic relatives of the Ornithopoda and Marginocephalia. Jeholosaurus, on the other hand, may be a true ornithopod. Bob Bakker (currently at the Houston Museum of Natural History) once speculated that the primitive ornithopod (or ornithopod-like dinosaur) Drinker was a burrower. More recently, a newly discovered (first described in March 2007) Early Cretaceous ornithopod Oryctodromeus was found actually buried inside its burrow. 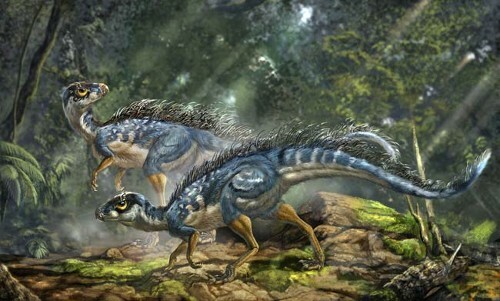 NEW December 2011: South Korea finally has some dinosaur genera first names from that nation. One of these is the small Late Cretaceous ornithopod Koreanosaurus, a close relative of the burrowing "zephyrosaurs" of North America. Another small Asian ornithopod named this year, Haya of the Late Cretaceous of China, seems to form a group with the older Jeholosaurus and Changchunsaurus (also of China). NEW December 2013: Caleb Brown and colleagues have restudied the material of the small ornithopods, and find that the burrowing Orodrominae (what I called "zephyrosaurs") and the Thescelosaurinae (which includes Thescelosaurus and the Asian "jeholosaurs") form a single major group, Thescelosauridae. NEW January 2015: New shaking around the primitive ornithopod and primitive neornithischian part of the tree. In the latest studies, Orodrominae turns out to be the most primitive ornithopods, followed by Jeholosauridae (a group known from the Cretaceous of Asia). Thescelosaurus is much more closely related to iguanodonts than these dinosaurs. The biggest news in primitive neornithischian studies, though, is Kulindadromeus of the Jurassic of Siberia. In terms of its skeleton it is nothing special: it is a lot like Hexinlusaurus or Othnieliosaurus. But because it was found in very fine grained lake sediments, its body covering was preserved. And there is a LOT of stuff going on in body covering: some rounded scales, some plate-like scales; some ring-like scales on its tail (sort of like the ring-like scales the feet of some birds); simple fuzz as in Tianyulong and many theropods; and bizarre plates with fuzz coming out from them. 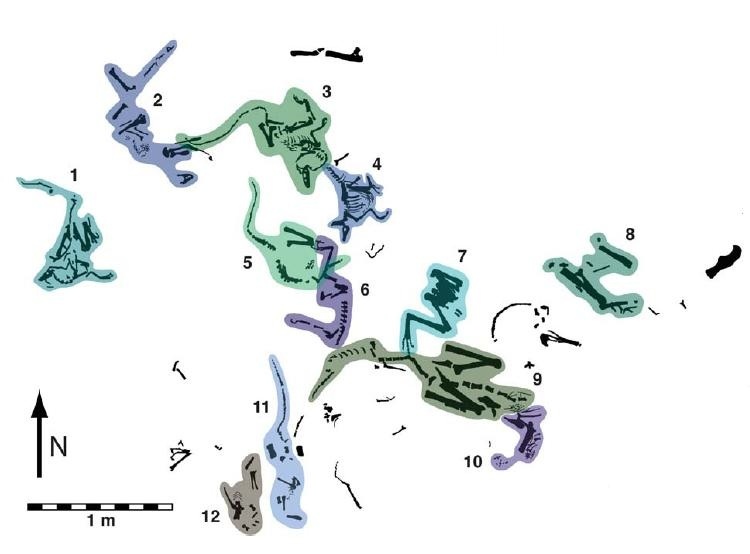 This shows that a) even more ornithischians than we knew were fuzzy and b) the variety of body coverings of dinosaurs (even the very same dinosaur!) could be very complex. It also points to the real possibility that the ancestor of ALL dinosaurs was fuzzy, or at least could grow fuzz on some parts of its body. Different groups of dinosaurs did this to different degrees: at present there is no evidence for fuzz in sauropodomorphs, for instance, and big hadrosaurids and ceratopsids were definitely covered mostly in scales. But fuzz is no longer just a theropod trait. (Okay, Tianyulong already proved that, but this reinforces it!). Oh, and Kulindadromeus is known from many, many individuals, so we will know lots more about its anatomy and growth in the near future. "Iguanodon" atherfieldensis was slender European iguanodontian once considered a species of Iguanodon. However, recent work by Gregory Paul suggests it is actually more closely related to hadrosaurids than to Iguanodon proper, and so in late 2006 he gave it its own genus name: Mantellisaurus. We will have to see if that name stands, or if instead this species turns out to be the same as the previously-named but poorly-known Vectisaurus. In the past, when you have seen the skull of the Late Jurassic iguanodontian Camptosaurus, it turns out you've seen the wrong dinosaur! Re-examination of the skull by Kathleen Brill and Kenneth Carpenter (Denver Museum of Nature & Science) published in late 2006 shows that the long, squared off skull that everyone (including I and Luis Rey) thought was Camptosaurus was really from a younger, Early Cretaceous dinosaur. Brill and Carpenter have given this dinosaur the name Theiophytalia. Thankfully, however, the actual Camptosaurus skull is now known from a nearly complete specimen, and it is found to be more triangular (something like the head of Dryosaurus, only larger). Although it is in the genus list in the book, I think it is worth mentioning one of the strangest iguanodontians here as well. That is Lanzhousaurus of Early Cretaceous China. While most iguanodontians evolved more but smaller teeth over time, Lanzhousaurus decided to "buck the trend" and developed fewer but enormous teeth. In fact, these are the largest teeth known of any herbivorous dinosaur. NEW January 2008: Greg Paul has additionally recognized two new Early Cretaceous dinosaurs that were once considered species of Iguanodon: slender Dollodon bampingi of Belgium and Dakotadon lakotaensis of the United States. NEW December 2010: The break-up of Iguanodon continues, as more and more species are assigned to their own genera. Darren Naish has written an series of excellent reviews of this topic. Basically, the name "Iguanodon" was used in the past to cover a wide variety of Early Cretaceous iguanodontians: some were more distantly related to hadrosaurids than true Iguanodon and others closer. Among the more notable is tall-spined Hypselospinus. Brand new (well, newly discovered) iguanodontians that were never part of the classic "Iguanodon" genus have been unearthed from Early Cretaceous-aged rocks of Utah, and named Hippodraco and Iguanacolossus. NEW December 2011 After the "Iguanodon Explosion" of the last few years, there has been a bit of an implosion. Dave Norman (Cambridge University) has been re-examining much of the material once considered "Iguanodon", and agrees that there are several dinosaur genera represented here, but perhaps not as many as thought in the last few years. He considered "Dollodon" to belong to Mantellisaurus, and "Kukufeldia" and "Sellicoxa" to belong to Barilium. Furthermore, Andrew McDonald (a graduate student at the University of Pennsylvania) suggests that "Proplanicoxa" is simply a specimen of Mantellisaurus. These changes are reflected in the Winter 2011 version of the appendix. However, 2011 is the year of the "Camptosaurus" explosion. Andrew McDonald (a student at the University of Pennsylvania) has examined the primitive ornithopods once considered to be species of Camptosaurus, and has found instead that some of these are closer to Iguanodon and the hadrosaurs than they are to true Camptosaurus. Thus, the former "Camptosaurus" aphanoecetes is now Uteodon, and "Camptosaurus" depresses is now Osmakasaurus. NEW January 2015: What is new in the realm of iguanodonts? Dave Norman's clarification of the "Iguanodon Explosion" continues. In his analyses, Iguanodon bernissartensis contains "Dollodon seelyi"; Mantellisaurus atherfieldensis contains Vectisaurus, Sphenospondylus, Proplanicoxa, Dollodon proper, Mantellodon carpenteri, and some of the specimens once called Darwinsaurus; and Hypselospinus fittoni contains Wadhurstia, Huxleysaurus, and most of the specimens called Darwinsaurus. Barilium dawsoni contains Kukufeldia (possibly), Torilion (unquestionably), and Sellacoxa. One issue that isn't resolved is the position of Iguanodon anglicus (the ORIGINAL Iguanodon species): is it actually closer to I. bernissartensis than to these other forms? In his reanalysis, Iguanodon, Barilium, and Mantellisaurus are all each other's closest relatives, and together with Jinzhousaurus and Bolong of China and Proa of Spain form a group for which the proper name would be "Iguanodontidae". Hypselospinus is not an iguanodontid, and instead is farther from hadrosaurs than are the iguanodonts. Norman also has introduced several useful new group names within Ornithpoda: Clypeodonta, for all ornithopods closer to Parasaurolophus than to Thescelosaurus; Neoiguanodontia, for the group uniting Hypselospinus and hadrosaurids (and thus containing the iguanodontids as well); and Hadrosauromorpha, for all dinosaurs closer to Parasaurolophus than to Probactrosaurus. In small ornithopod news, newly named is Eousdryosaurus, a dryosaurid from Portugal. NEW January 2010: Some changes in terminology for future editions of this chapter: I will probably call the whole chapter "Hadrosauria", and where I used "Hadrosaurinae" I will use "Saurolophinae" following work by Albert Prieto-Marquez of the American Museum of Natural History. (Hadrosaurus may actually be more distantly related to other "hadrosaurines" than the lambeosaurines are!) These changes, and some changes among the interrelationships of the duckbills, will be reflected in the revised 2010 genus list. A new discovery is the primitive Italian hadrosaurian Tethyshadros, one of the most complete skeletons of a large Mesozoic dinosaur from Europe. NEW December 2013: The lambeosaurines on the cover the book now have a name! When Luis Rey drew them, we went by the idea that the giant lambeosaurine specimens from Baja California were actually Lambeosaurus. However, new studies show that this dinosaur is its own distinct genus, Magnapaulia. The "unicorn" crested lamebosaurine Tsintaosaurus turns out to have a very different kind of crest. NEW January 2014: Forgot these in the last update! Even well-known duckbills like Edmontosaurus can have surprises: for instance, at least some of them had a small fleshy comb on the tops of their heads. Also, it turns out that hadrosaurid chewing movements were even more complex than I discussed in the book. NEW January 2015: "Hadrosaurinae" is back, probably. Some recent analyses do find that Hadrosaurus is closer to Saurolophus, Edmontosaurus, and company than to Lambeosaurus, so the flat-head dinosaurs are back to being "hadrosaurines". A new Mongolian dinosaur Plesiohadros has been described; it is not quite a hadrosaurid, but very closely related to them. 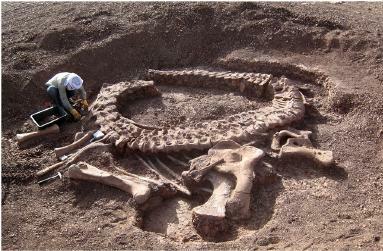 It is also the largest dinosaur found so far among the desert deposits of Mongolia. A new review of the giant Chinese edmontosaurinin hadrosaurine Shantungosaurus confirms what most people suspected: that "Zhuchengosaurus" and "Huaxiaosaurus" were just specimens of Shantungosaurus. A new study by Scott Persons and Phil Currie of the University of Alberta suggests that hadrosaurs--although slower than tyrannosaurs--were endurance runners ("marathoners"). This may have helped them survive in a world with faster predators: if they managed to escape for long enough, the tyrant dinosaurs would get winded and give up the chase. Jack Horner (Montana State University) has recently suggested that Pachycephalosaurus, Stygimoloch, and Dracorex are all different growth stages (basically adult, "teenager", and kid) of the same species. I think that this idea has a lot going for it, and look forward to this study being presented in more detail. (As I mention in the book, dinosaurs had a lot of growing up to do in their life, so they went through a lot of different sizes and shapes between hatchling and adulthood. So many different "species" of dinosaurs will likely turn out to be just different growth stages). NEW January 2010: Related to the above study, new work suggests that Homalocephale is just the juvenile stage of Prenocephale. NEW December 2011: Functional studies by Eric Snively (Ohio University) and Jessica Theodor (University of Calgary) strongly support the idea that at least some pachycephalosaurs were in fact headbangers. NEW January 2015: Forgot to get this in last year: a pair of studies by Joseph Peterson (University of Wisconsin) and colleagues supports the hypothesis that head-banging, not erosion after death caused the damage seen on the domes of pachycephalosaurs. Plenty of new primitive ceratopsians have been discovered, including the first European ceratopsian fossils (teeth only, but resembling most closely those of leptoceratopsids, announced in July 2007). As more and more of these are discovered, they highlight the fact that ceratopsians spent most of their history as small dinosaurs under the shadows of sauropods, thyreophorans, and iguanodontians. It is only at the very end of the Age of Dinosaurs, and only in western North America, that they became a major group of large-bodied dinosaur. NEW December 2010: Additional definite primitive ceratopsians from Europe has been discovered. Ajkaceratops from the Late Cretaceous of Hungary is a cousin to Asian Bagaceratops. NEW January 2008: Eotriceratops xeriinsularis is a newly described ceratopsine very closely related to Triceratops (heck, possibly even ancestral to that later and more famous dinosaur!). NEW January 2010: With the discovery that primitive centrosaurines (like Albertaceratops) and advanced non-ceratopsid ceratopsians (like Zuniceratops) had long brow horns suggests that poorly-known Ceratops itself may not be closely related to the other dinosaurs that are called "Ceratopsinae" in the book. Therefore, in future versions I will stick to more common use and call Triceratops, Chasmosaurus, and their kin "Chasmosaurinae". 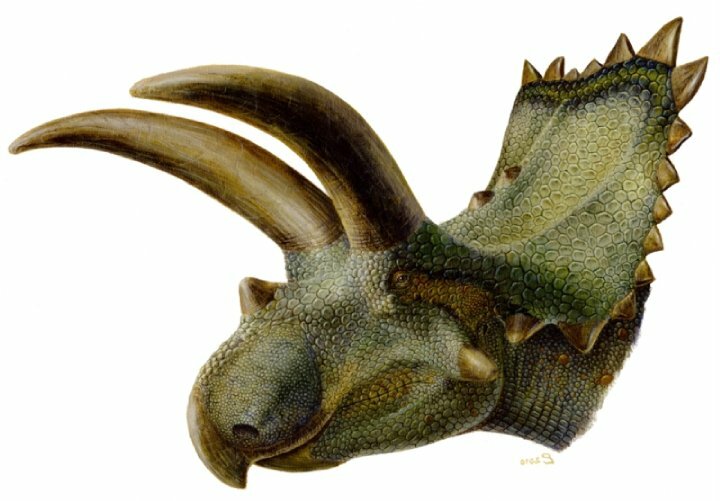 It has been suggested that Turanoceratops from Uzbekistan is a chasmosaurine ceratopsid: if true, it would be the first true ceratopsid from outside of western North America. However, it might be a Zuniceratops-like near-ceratopsid. On-going research is suggesting that Torosaurus may not be a distinct type of dinosaur, but rather just a fully-adult Triceratops. This is an interesting idea, and I await the full analysis of this idea. NEW December 2010: The "Torosaurus is just the adult form of Triceratops" paper mentioned above is finally published. As with most things in Science, you can't say that it is 100% proven. However, my personal opinion is that the scientific ball is in the opposition's court now: it is up to those who reject this claim to give positive evidence showing that this hypothesis is incorrect. One amusing (and at times very frustrating) thing was that the news media and blog-commentators often got the implications of this totally backwards! There were lots of articles saying "Triceratops never existed" and that we have to call this dinosaur Torosaurus now. If only those reporters had read my book!! (Okay, or any other book that explains taxonomy...) It isn't whether the name is associated with an adult or not, or a bigger skeleton or not, or a cooler name or not, which is the deciding factor. It is just the date of publication. Since Triceratops was named in 1889, and Torosaurus in 1891, "Triceratops" is the proper name. While we may have "lost" the name "Torosaurus", we gained a dozen brand new genera of Ceratopsidae this year, by far the most ever added to any of the traditional dinosaur "families" in any year! Some, like Mojoceratops, Vagaceratops, and Rubeosaurus were new names for specimens already known (and referred to Chasmosaurus, Chasmosaurus, and Styracosaurus, respectively). Others, though, were brand new: Mexican Coahuilaceratops with horns even more massive than Triceratops; tall-spiked Diabloceratops of Utah; Kosmoceratops and Utahceratops, also of Utah; little Tatankaceratops (which I suspect will wind up being a juvenile Triceratops); and, in the last days of 2010, Titanoceratops, a giant older New Mexican relative of Triceratops (almost as big as that dinosaur), based on a skeleton previously considered to be a giant "Pentaceratops". 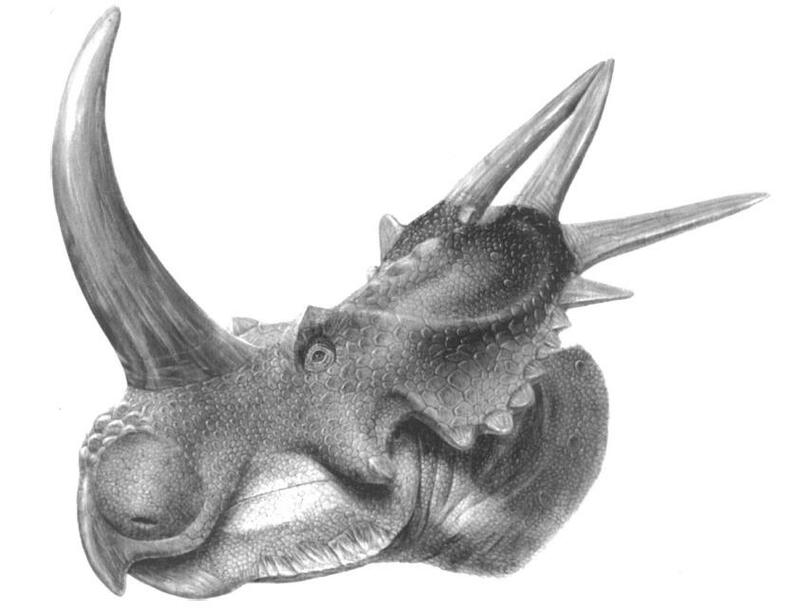 And for the first time, confirmation of a definite Asian ceratopsid, the Chinese centrosaurine Sinoceratops. NEW December 2013: Even more new centrosaurines and chasmosaurines: see the appendix for details! Also, still no resolution on the whole "Is Torosaurus just a grown-up Triceratops?" thing. Both sides have stated their case, but the evidence doesn't decisively fall in one camp. Yet. NEW January 2015: Got a spare hour? Watch and hear about the "Triceratops vs. Torosaurus" debate. 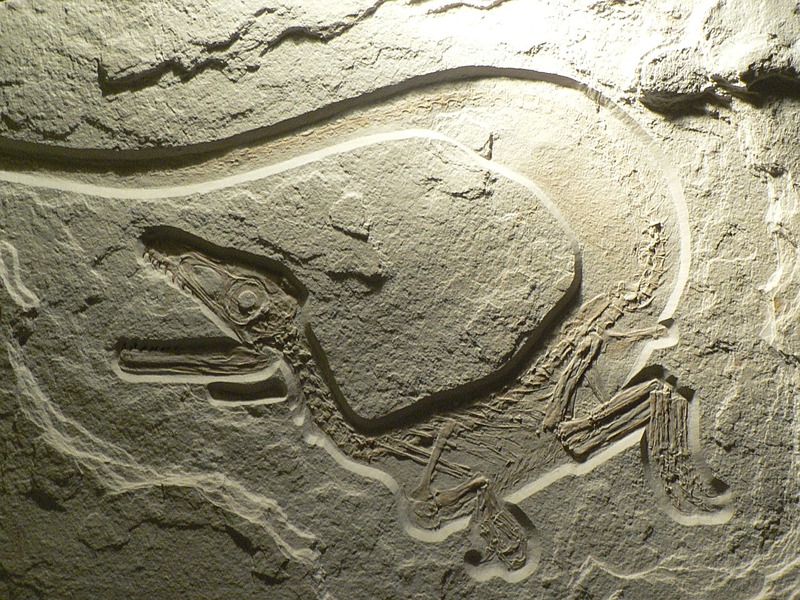 In September 2007, an assemblage of Psittacosaurus fossils found together was described. This collection of skeletons of the little ceratopsian were buried together under volcanic ashes. Examination of the fossils by Zhao Qi (Institute of Vertebrate Paleontology and Paleoanthropology, Beijing), Paul Barrett (The Natural History Museum, London), and Dave Eberth (Royal Tyrrell Museum of Palaeontology) indicates two different age groups of youngsters: some about 1 and a half years old and the others about 3 years old. This shows that they were born at two different times, but the fact that they were buried together may indicate that they lived together as a big family. NEW December 2010: Yet another peril that baby dinosaurs had to face: early snakes!. NEW December 2013: A new discovery is nesting colonies of therizinosaurs. And check out this cute baby Chasmosaurus! NEW January 2015: I should have included this before: watch the changes in Tarbosaurus as it grew up. Chapter 37: Dinosaur Behavior: How Did Dinosaurs Act, and How Do We Know? NEW December 2010: New news on the locomotion of tyrannosaurs front. A new study by University of Alberta graduate student Scott Persons and his advisor Phil Currie shows that the tail muscles of Tyrannosaurus and its kin were bigger than previously thought. Although it added more weight to the dinosaurs, it also added power, and suggests that they may have been faster than some previously calculated. Other work by Casey Holliday of the University of Missouri and colleagues shows that people have been underestimating the amount of cartilage between bones in dinosaurs. This effects things like our calculations of their height and length, as well as of the mechanics of their joints. NEW December 2010: As I discuss in Chapter 38, there is a lot of evidence suggesting that dinosaurs had metabolisms more like modern mammals and birds than like cold-blooded lizards and snakes and turtles. Similar evidence exists for dinosaurs weird-looking flying cousins, the pterosaurs. 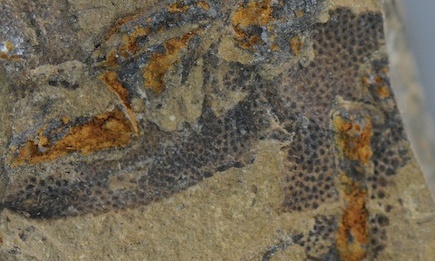 This year, however, comes evidence in the form of the chemical make-up of the bones of marine reptiles that the advanced tuna-shaped ichthyosaurs and the paddle-finned plesiosaurs may also have been warm-blooded, even though the more eel-shaped primitive ichthyosaurs and the fingered-and-toed relatives of plesiosaurs were not. Additionally the mosasaur sea-lizards of the Late Cretaceous may have also been warm-blooded as well, but the evidence for this is less strong. It is worth noting that modern day tuna and billfish (sailfish, swordfish, etc.) are essentially "warm-blooded fish", and evolved a very similar body shape to the advanced ichthyosaurs. NEW December 2011: New lines of evidence that dinosaurs had warm-blooded metabolisms come from new studies of the body temperatures of sauropods and the presence of a high number of nutrient foramina (blood vessel openings) in dinosaus compared to cold-blooded animals. In other aspects of their biology, at least some dinosaurs and pterosaurs may have been nocturnal based on aspects of the relative proportions of their eyes. NEW January 2015: New analyses of the insides of the noses of pachycephalosaurs show that their nasal turbinates would help cool the blood going to the brain. This was actually probably widespread in all dinosaurs, but it is easier to study in pachycephalosaurs due to the very solid skulls which preserve many details. Were dinosaurs (including Archaeopteryx and other early avialians) intermediate between fully cold and fully warm-blooded? A new study suggests this. This supposed "mesothermy" in dinosaurs (a term originally coined by Dr. Scott Sampson) is an intriguing possibility, but needs further study. 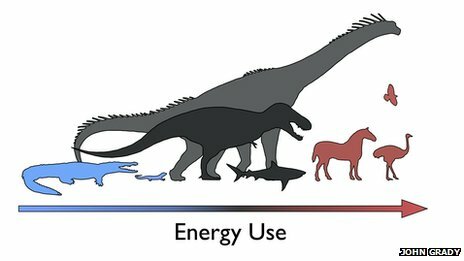 One thing to point out is that the authors agree that dinosaurs generated heat internally (and thus were endothermic by definition), but that their control over the body temperature wasn't as strong as in homeothermic animals. NEW December 2010: Chris Noto, currently of Grand Valley State University in Michigan, has published an examination of the differences and similarities of the different communities of dinosaurs in the Late Jurassic, and found that brachiosaurs and their kin preferred more arid (dry) habitats, while stegosaurs and diplodcoids preferred wetter ones. NEW December 2011: A new study of the chemical composition of sauropod teeth shows that at least some of them seem to have migrated to the mountains and back to the lowlands in the course of a year. The genus update is available here. A list of answers to frequently asked questions is available here. (Not yet mounted online). The Dinosaur Mailing List Archives is a compilation of the old postings from the Dinosaur Mailing List.